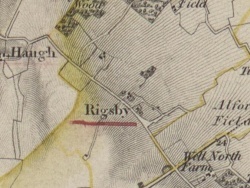 The parish of Rigsby is an early Danish settlement (the village on the ridge) and is listed in the Domesday Book with one principle tenant (Leosard) five villagers and three smallholders. In those days there were five Lordships in this area. Herbert of Rigsby was a blood relative of William the Conqueror, the son of Odo, the Archbishop of York. 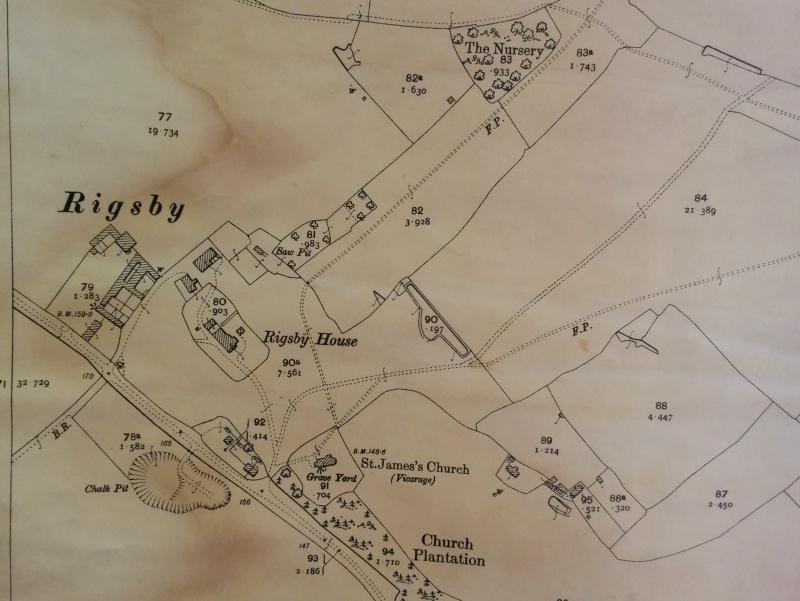 1130 Gilbert, first son of Herbert gave common land at Lissington to Louth Park Abbey, and common pasture at Rigsby to Cisterian nuns at Greenfield. 1185 Herbert died, leaving 5 sons, the eldest Gilbert only 10 years old, and a twice married widow still only 30 years old. The land was taken in hand by the King for the custody of the Archbishop of York until the elder son Gilbert came of age in 1195. 1195 Gilbert, attaining maturity, gave the land at Lissington to the Chapter House at Lincoln Cathedral. Following a law suit against Robert of Well as to it’s ownership, Gilbert gave the Advowson of Alford Church (presumeable Rigsby Chapel?) 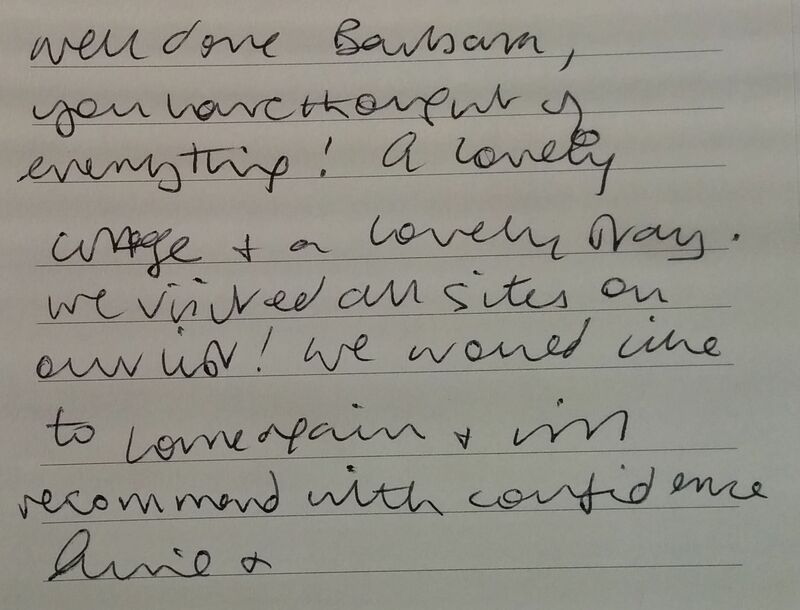 to the convent of St. Katherine at Lincoln. He married Elizabeth (Like of Leake), and died 1242, leaving son Thomas to inherit land at Riggesby, Allesby, Thoutheby, Aufford, Welle & Sutton. 1245 Thomas, died, leaving elder son John , and newborn son Thomas. The estates were reclaimed by the Archbishop. 1262 Follwing another complicated law suit, John confirms to Henry of St Katherine the Advowson of Alford Church. His daughter Amica marries John Flory (Manor of Rigsby). Following his death, the esates revert to Thomas (1245-1326) the second son of Thomas of Riggesby who had died in 1245. 1298 Knighted Sir Thomas of Riggebi after performing 2 years of service to the King, fighting the Scotts. 1316 His son Ralph certified Lord Bourn of Cambridge, did homage to the King 1326, died 1332. 1317 Licenced to grant a Messuage in Hannah, Markby, Hagnaby, Sutton & Tetford. 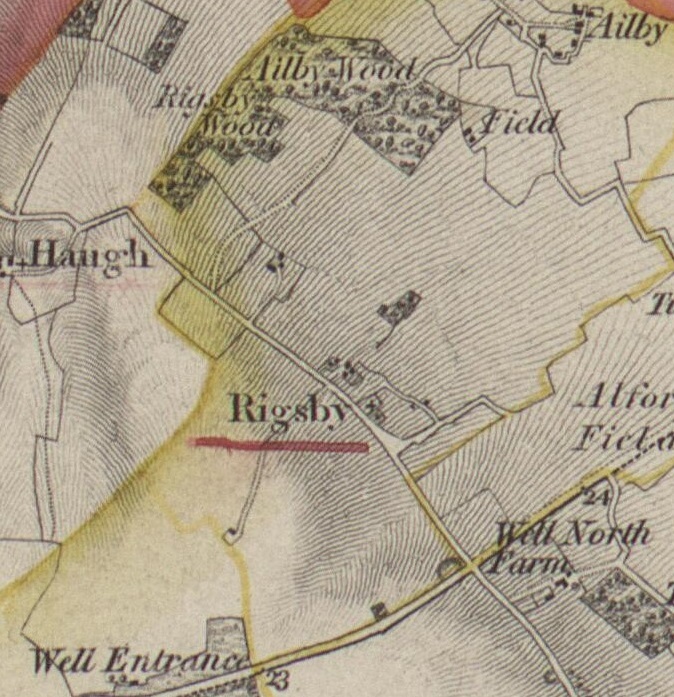 1346 Thomas of Rigsby had 1/60 part knights fee of Lissington, and edmundenum on fee in Rigsby. (formerly John Flori & Margaret Hamby) On his death, his estates passed by marraiage of his daughter Olive to Thomas of Totheby. This family had little land here, 1 /22nd part of a Knight’s fee in Saleby Mid C14th to Mid C17th 1349 The Plague (The Black Death), 1536 Lincolnshire Uprising, 1630 The Plague returns. 1628 Jane, Daughter of Richard of Totheby married at Rigsby (6th October) to Robin Thornhill, Vice-Admiral of the County of Lincoln, (1602-05). 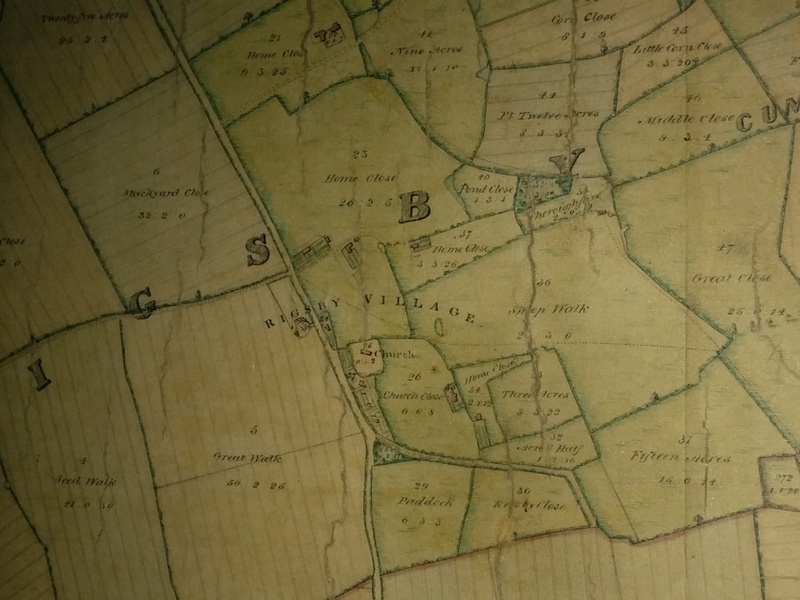 1604-1674 Thomas of Totheby He became impoverished and sold the estates to a rising young lawyer , Robert Christopher, the son of Peter Christopher , a tenant at Saleby who himself had married at Bilsby 2nd July 1604 to Alice, the daughter of Robert Hastings. 1712 Death of Edward of Towthby (11th January) last of the line. The last male heir of the Rigsby line, Thomas, died in 1346. His daughter, Olive, married William of Tothby passing The Lordship to him. 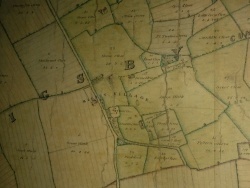 The Tothby family sold their Estates including a substantial part of Alford to Sir Robert Christopher in the C17th, which passed by marriage to his daughter Elizabeth Snead and then of her daughter Lucy, to John Manners, the Duke of Rutland, and then to subsequent generations over 200 years to Robert Christopher-Nismit-Hamilton, still part of the Manners Estate, but now includes the neighbouring Well estate, purchased from Bateman/Dashwood esq, in total some 7000 acres and a large proportion of Alford, under the estate management of John Higgins from Alford Manor House. 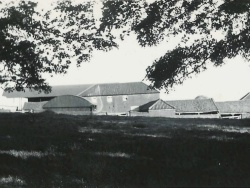 Robin Adam Christopher and his wife Lady Mary Nisbet Hamilton acquired the Well Estate in the 1830s and sold the entirety to Hugh Rawnsley in 1915. 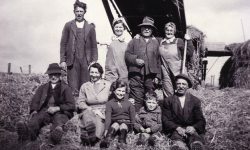 The Read family first came to Rigsby House Farm in 1928 when Fred Ward Read already a tenant at Ulceby close by, started a teancy at Rigsby. We initially rented from the Well Estate of the Rawnsley’s with Fred’ son, Jack, and daughter, Connie, moving into Rigsby House May 22nd 1929. Jack and his brother, Charles, where made partners of FW Read & Sons in 1938. With Fred retiring 1948. 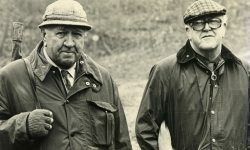 Jack and Charles in 1955 made FW Read & sons a limited company and the tenancy was transferred to the newly formed FW Read & Sons Ltd. 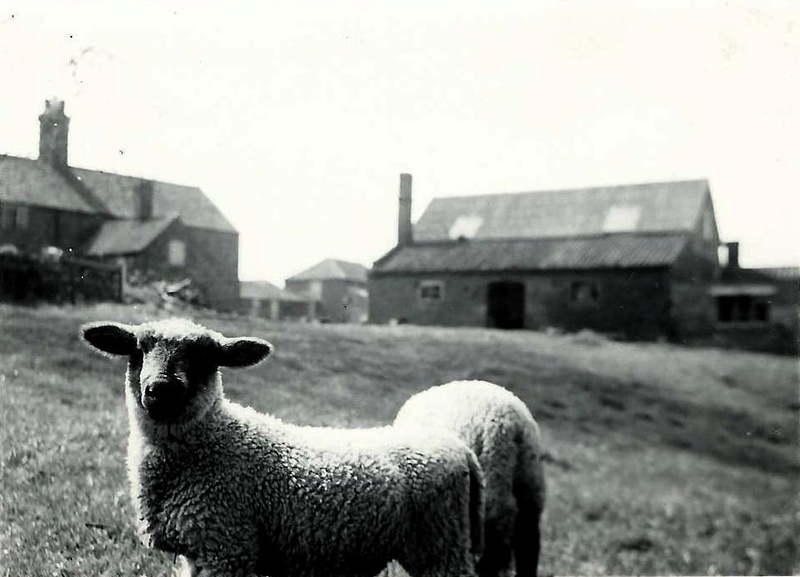 In 1961 that concern, leaving the original one at Ulceby and Rigsby Farming Company based at Rigsby. 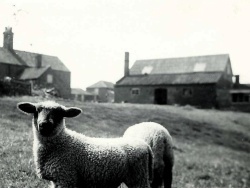 After a succession of Landlords from the 1950’s we purchased the freehold in 1985. 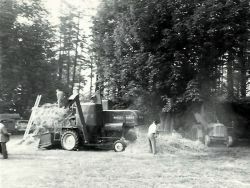 Jack Read initially managed the farm before his son’s Richard and William took over. Richard’s son Michael joined the Directors in 2000 with William’s sons Paul and Stephen becoming Directors in 2013. 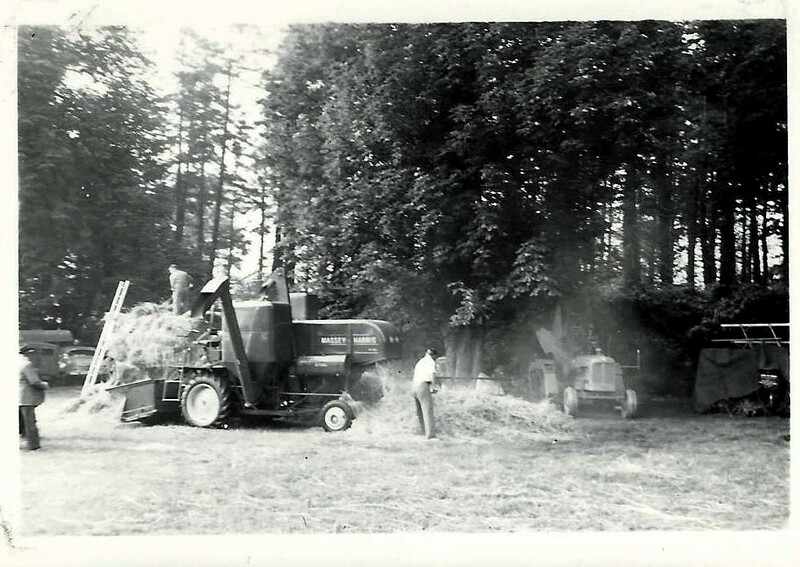 The photo of the Massey-Harris Binder shows operator Tom Adlard, tractor driver is Ern Dennis. 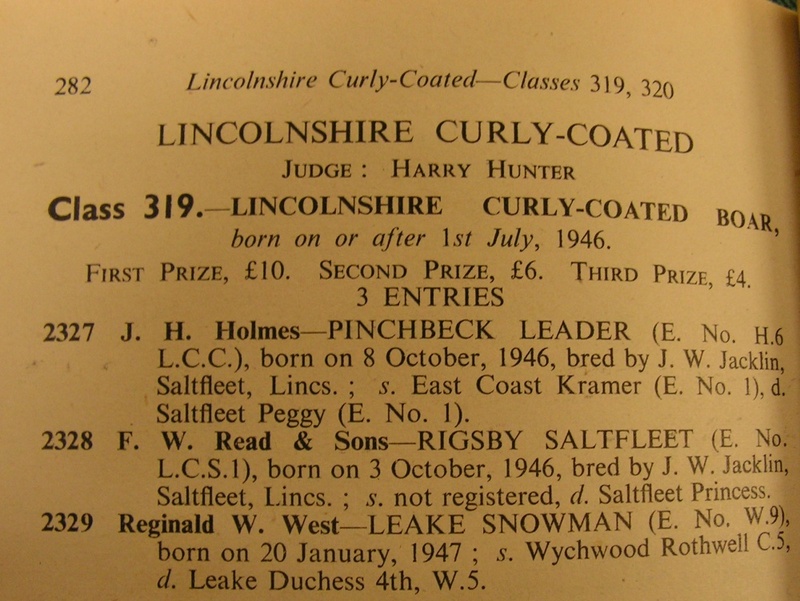 The boy standing on the wind-board looks fair-haired and might be Ern’s second son, Brian (born about 1938). 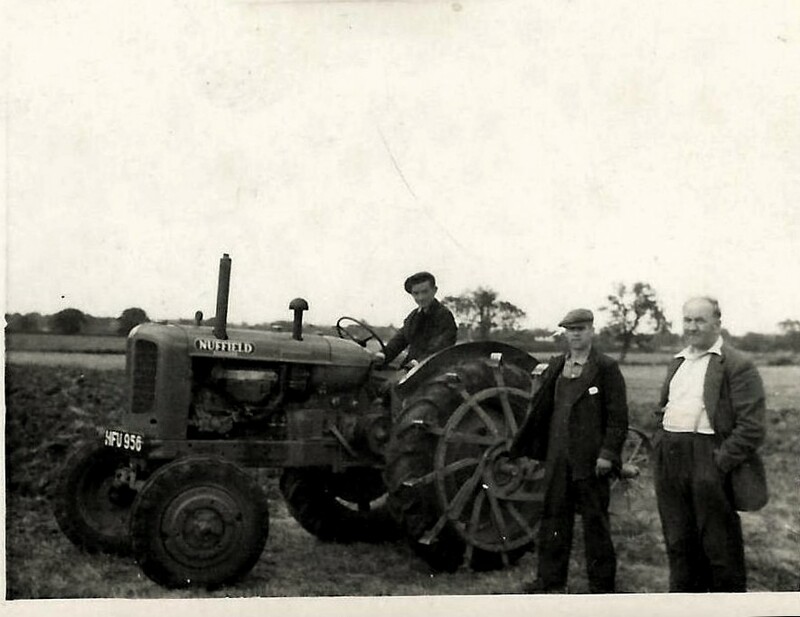 The binder is a No 6 with a 7 foot cut and the tractor a Case DEX, new in 1947. One of only two imported then and we had to wait delivery until it had been exhibited at the Royal Show in Lincoln and also at the Peterborough one. Foreman’s Cottage & Stable Block with forge chimney - long since removed. Rigsby Cattle circa 1947 since the roof is shiny (indistinguishable), no haystack, no sign of loading ramp in the far bottom bay. High Summer, (cattle have summer coat and little shadow). Maybe our John Deere combine in the centre. 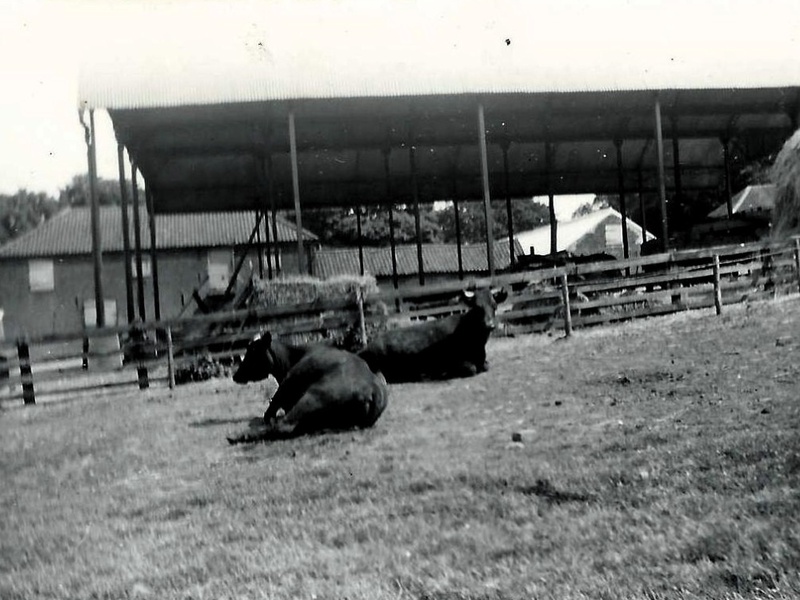 Note the horns on the cattle - we were de-horning the calves at this time (with either a cauterising iron or maybe a Collodion solution applied to the buds) but had not got round to sawing off the adult ones. 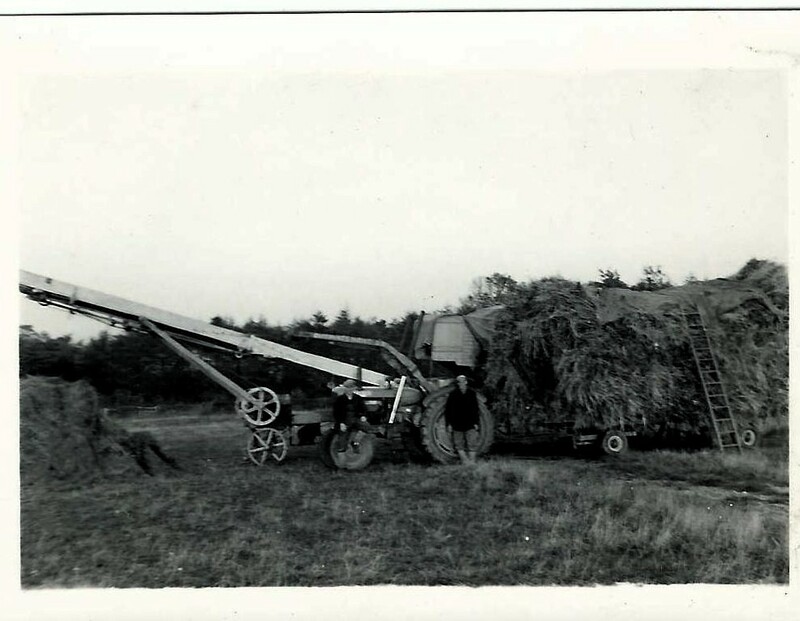 Grain Plant 1956 - maybe the inaugural load from a Pettitt trailer. The sack drying part and the ramp is yet to be constructed. The tractor is a 1950 or 51 Nuffield Universal, a rowcrop model (adjustable wheeltrack)), a Morris TVO (kerosene) motor producing 38bhp. 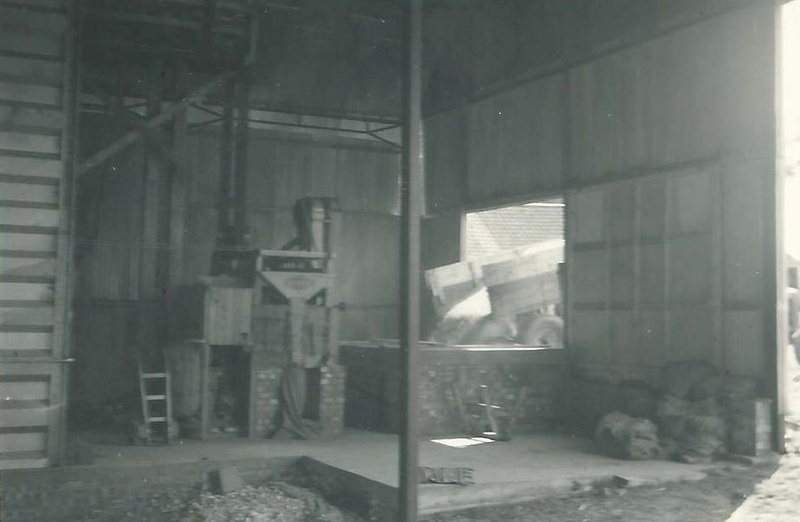 It is equipped with a pulley (for driving threshing machines, saw tables and the hammer mill in the bottom barn) and also an adjustable set of strakes for extra traction. It also has front wheelweights. 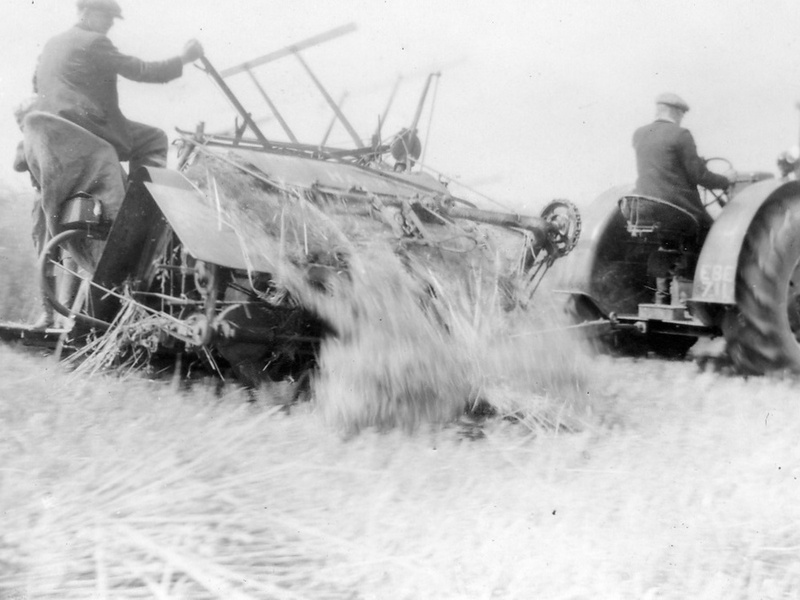 The plough was a single furrow 16inch digger-bodied Ransomes. 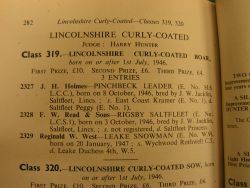 The driver is Les Feek with foreman John Holmes and JB Read in attendance. 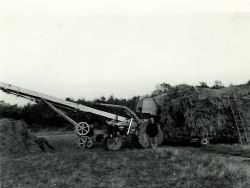 The same tractor, now fitted with a hydraulic Skyhi loader (note the ram bodies protruding through the loader frame) has towed a trailer (the Dougill-made one) loaded with rakings alongside the threshing drum (behind the trailer). 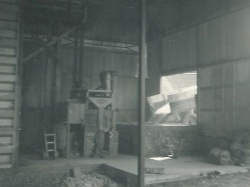 The threshed straw drops into the Lainchbury elevator, powered by its own Petter petrol engine or by belt from the threshing machine. 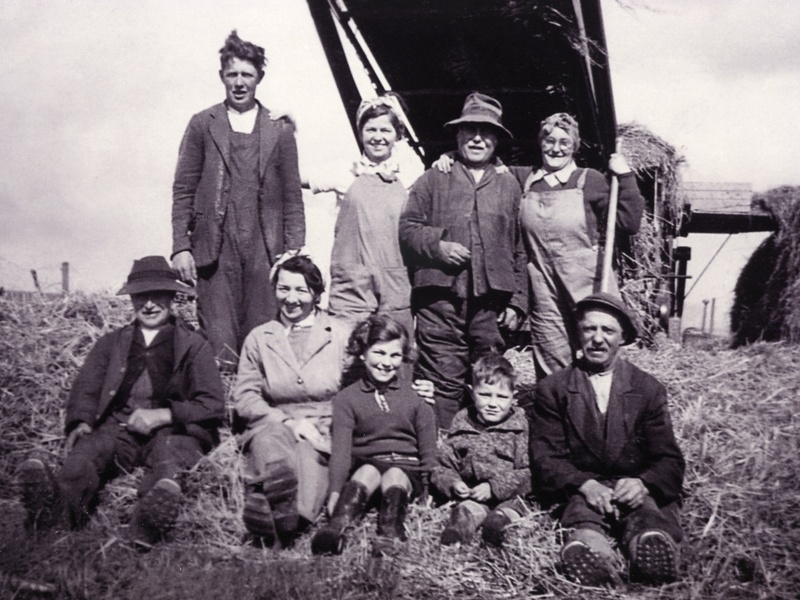 Rakings are the loose straws of corn left behind in the field after the binding, stowking and carting off process, collected up by a mechanical tractor rake, this was one of Richard Read’ first summer holiday jobs using the spud-wheeled Fordson followed by paint that elevator and rake. This is the same process but this time using one of the Combines from the Ulceby Farm, a Massey Harris 726, with is crop reel removed. Maybe around Burnett’s or Lodge Farm in Ulceby. 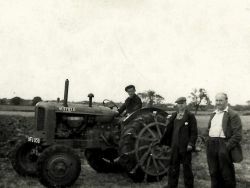 Also in the picture is a sheeted down binder and a trenching machine on ’walking wheels’ (New Fordson Major - powered) with sighting rod. 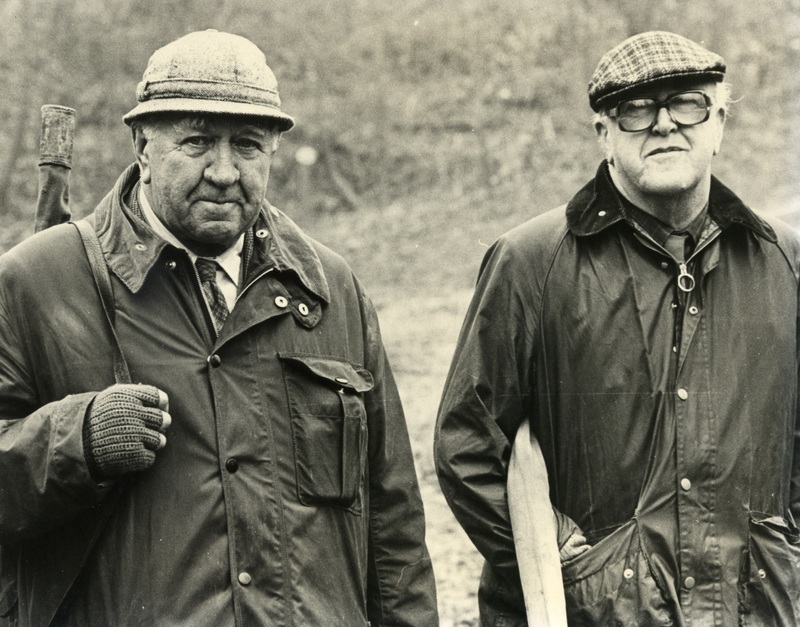 The chap on the left could be Reg Househam, The Ulceby foreman. Rigsby Wold Holiday Cottages, originally called Church Cottages, are believed to have been built in 1850. Initially to house the labourers of the farm and in latter years the widows of those labourers. 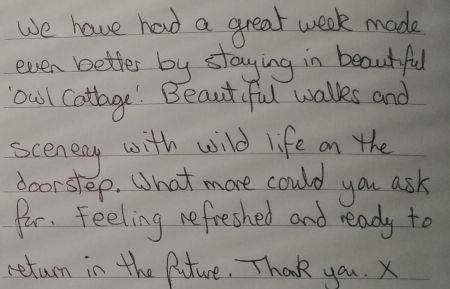 In 2007 Pheasant Cottage was converted to a holiday cottage, whilst Owl Cottage was converted to a holiday cottage in 2014 after a period of long term letting. 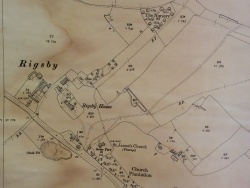 Derived from the Old Norse words ’hryggr’ (a ridge) and by (a farmstead or village), ’Rigsby’ probably aptly means ’the farmstead or village of the ridge’, Looking down onto the historic market town of Alford just two miles away to your right, with its working five-sailed windmill and C14th church. Rigsby provides an extraordinary vantage point from which to appreciate the vast beauty and variety of our uninterrupted countryside, literally from the Wolds to the Sea. Standing here today it is hard to believe that our Early Stone Age ancestors would have looked down a vertical chalk cliff to see waves thundering against a flinty beach some 30 metres below them. Now we look over the undulating glacial boulder clays of the Middle March and the flatter marine silts of the Outmarsh to the Sea some eight or so miles away. 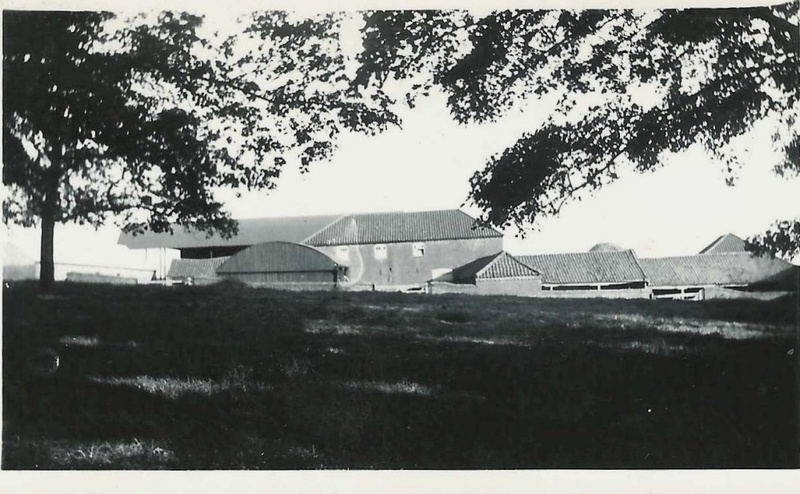 Looking across the March, with its intricate web of lanes, dykes and isolated farmsteads, it is not difficult to imagine how fair trade (smuggling) became a thriving activity in this part of Lincolnshire. All kinds of illicit goods changed hands indeed, out proximity to mainland Europe made for an easy exchange of Lincolnshire fleeces and Dutch gin! Following the line of this old marine cliff along the eastern edge of the Wolds runs Barton Street. 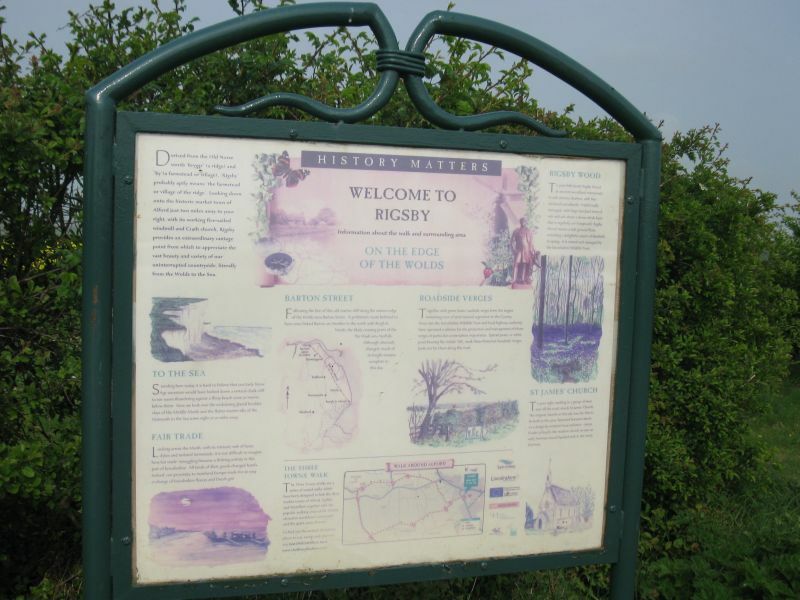 A prehistoric route believed to have once linked Barton on Humber in the north with Burgh le Marsh, the likely crossing point of the The Wash into Norfolk. Although obviously changed much of its length remains complete to this day. Together with green lanes, roadside verges from the largest remaining tract of semi-natural vegetation the in the County. 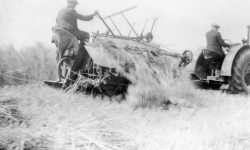 Since 1960 the Lincolnshire Wildlife Trust and local highway authority have operated a scheme for the protection and management of those verges of particular conservation importance. Special posts, or white posts bearing the initials ’NR’, mark these Protected Roadside Verges look out for them along this road. To your left stands Rigsby Wood an ancient woodland mentioned in 12th century charters, with fine medieval woodbanks. Traditionally managed, with large standard trees of oak and ash above a dense shrub layer that is regularly cut (coppiced), Rigsby Wood retains a rich ground flora, including a delightful carpet of bluebells in spring. It is owned and managed by the Lincolnshire Wildlife Trust. To your right, nestling in a group of trees just off the road, stands St James’ Church. The original church on this site was first to be built in the area. Restored between 1863-66 to a design by eminent local architect - James Fowler of Louth, the modern church re-uses an early Norman round-headed arch in the vestry doorway.